Presented in a lidded wicker basket with perishables in a separate insulated box. This hamper contains alcohol so you must be at least 18 years of age to purchase. 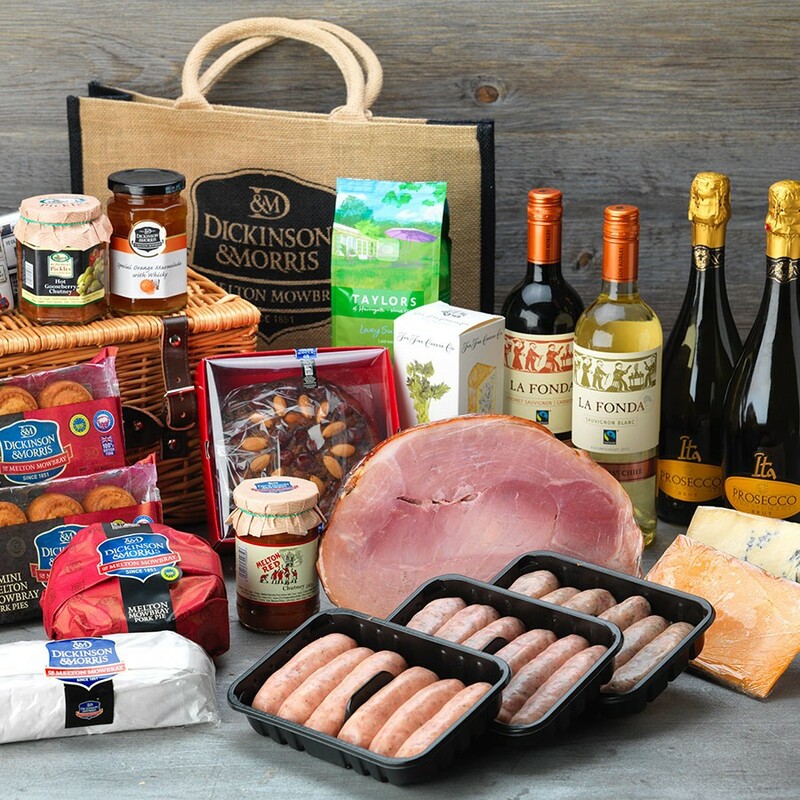 Our finest hamper. A collection of truly delicious and impressive foods fit to grace any table (or picnic blanket for that matter!). The perfect purchase for any lover of fine foods be it yourself, a relative, a good friend or even an acquaintance. Cabernet Sauvignon (red), Sauvignon Blanc (white) and 2 bottles of superb Prosecco set the scene for an impressive array of superb local specialities. Extra Large and Mini Melton Mowbray Pork Pies are supplemented with a selection of succulent sausages and Dry Cured Bacon. Blue Stilton and Rutland Red Cheese are enhanced with Walnut, Honey & Extra Virgin Oil Crackers, Hot Gooseberry and Melton Red Chutneys. A sizeable piece of British Roasted Ham is both impressive and moreish. Melton Hunt Cake, a rich moist fruit cake and can be enjoyed with a nice coffee made from the Taylors Ground Coffee. A unique Dickinson & Morris Jute Bag becomes your 'bag for Life' memento. Extra Large Dickinson & Morris Melton Mowbray Pork Pie (795g), British Roasted Ham (1.5kg), Pork & Stilton Sausages (400g), Lincolnshire Sausages (400g), Dickison & Morris Thick Pork Sausages (454g), Plain Dry Cured Bacon (400g), Wedge Rutland Red Cheese (200g), Wedge Blue Stilton Cheese (454g), Melton Hunt Cake (907g), Walnut, Honey & Olive Oil Crackers (125g), Melton Red Chutney (280g), Hot Gooseberry Chutney (280g), Fair Trade Santa Digna Cabernet Sauvignon (75cl), Fair Trade Santa Digna Sauvignon Blanc (75cl), 2 x Prosecco (75cl each), 12 Mini Melton Mowbray Pork Pies (2 x 300g), Dickinson & Morris Jute Bag, Ground Coffee (227g).